With just one week to go until my biggest ride of the year, Saturday represented likely the last long group ride I’ll do this season. I’ll admit it. I never thought I’d write “72 miles” and “easy ride” in the same sentence, but here it is. 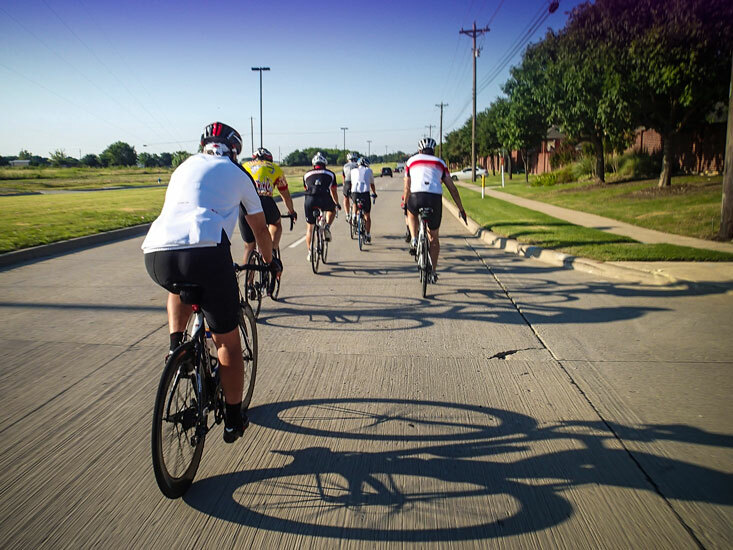 Yesterday I rode 72 miles with a friendly group, and it was an easy ride — the start of a taper week leading into one of my “A” events this year, the Hotter ‘n Hell Hundred. My workout calendar specified a four-hour ride yesterday with the option of a group ride, assuming I didn’t get too caught up in sprints and spend much time in zone 3 or 4. 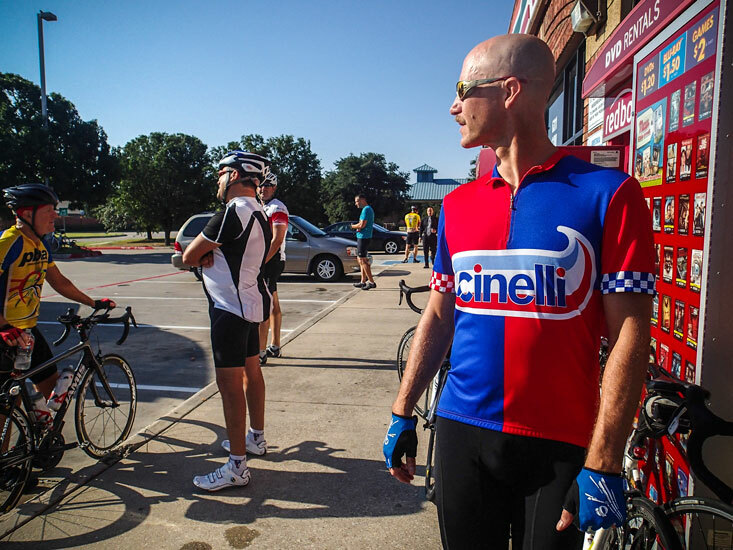 I ended up joining the Plano Bicycle Association’s DB Rec ride, a group formed specifically to prepare for the HHH (and, in the spring, for the MS 150). They, too, were tapering for the hundred-mile ride, and had planned a 70-mile route to take advantage of yesterday’s light winds out of the South. 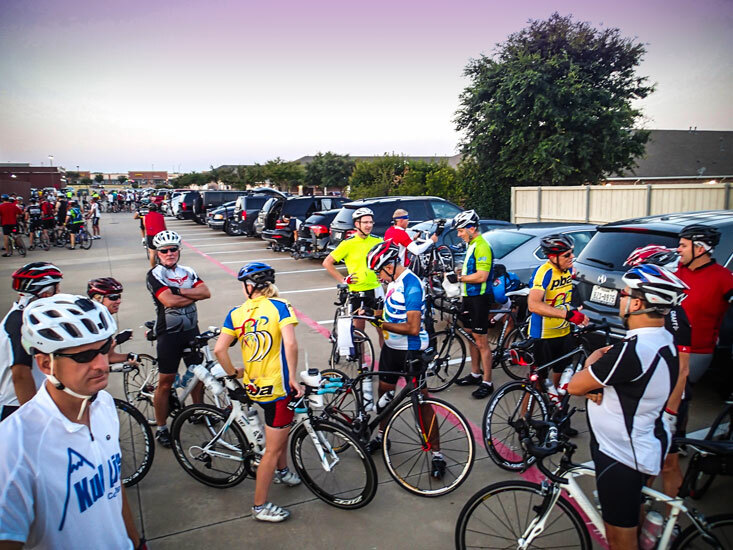 Most of the PBA Saturday rides start in the same parking lot behind a strip mall in Plano. Normally there are quite a few people out for each ride, but yesterday was incredible. 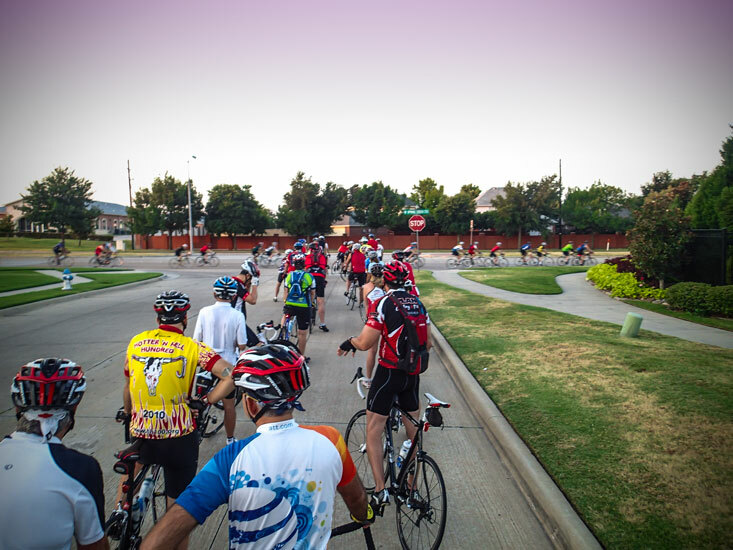 With only a week to go for HHH, it seemed like every cyclist in DFW was looking to get in one more long ride before the big event. “My” group is in the foreground with approximately 10 other groups getting ready to head out. Audra had a ride on her calendar today, too, and decided to join the “tweeners” ride for ~45 miles at a pace that looked right for her. Just as we started clipping in, Audra’s group rolled by and I managed to snap a quick picture. Audra rolling out for 45 miles in zone 3. It still blows me away that most people — including me until this year — have no idea how many people from all walks of life are cyclists. When cycling comes up in “normal” conversation, it feels like cyclists to most people are just brightly-colored, spandex-clad, moving speed bumps. But on a day like yesterday, it doesn’t feel that way at all. You see all sorts of people, young and old, fit and sagging — some riding zillion-dollar bikes with deep-dish aero wheels made of hundred-dollar bills laid up in epoxy, and some riding hand-me downs that you can tell (by the way the stem cants up at 45 degrees) don’t fit them. Waiting with the DB Rec crowd as other groups whiz by. On the road, winds turned out to be incredibly favorable. Combine this with uncommonly cool temperatures — it was 62 degrees when we pushed off — and a big group off of which to draft, and you get the makings of a super-relaxed ride. A PBA rider points out the crack in the road on the right, which can swallow a bike tire easily. When we reached the first rest stop at ~30 miles in, both Mitch and I felt like the ride hadn’t really started yet, even though temperatures had picked up a bit. Mitch chills out at the first rest stop. 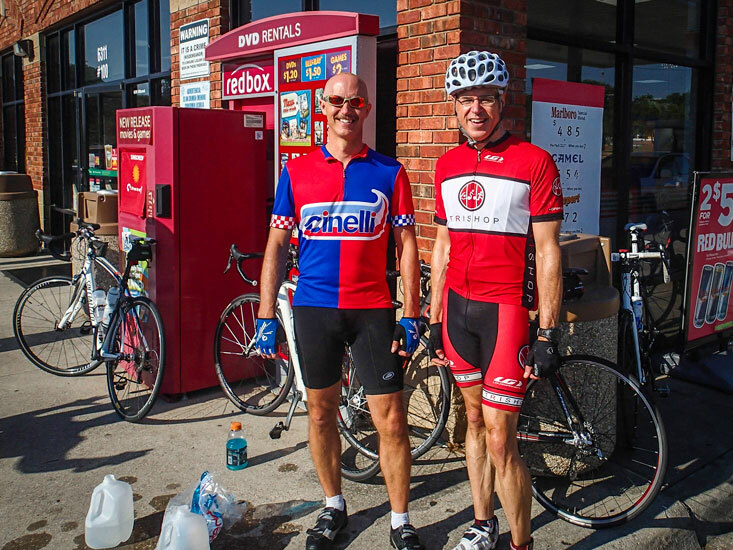 Another rider was kind enough to take a picture of Mitch and me together. We encountered a little bit of wind as the ride stretched on, but it was still easy going. The route was fun, too, wrapping around north out of Plano, then looping west through North Frisco, passing just a mile or so from Audra’s and my house. Our little peloton rolls down Main street in Frisco, soon to pass the MLS soccer stadium. 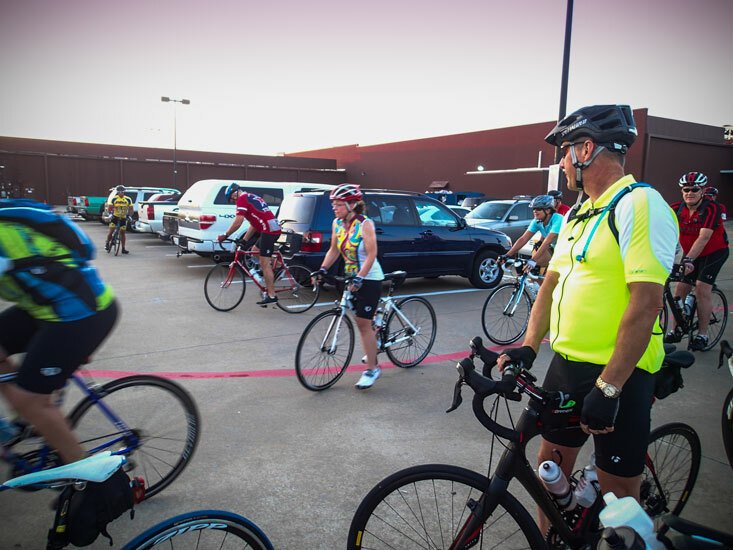 Right before the second rest stop, the ride leader pointed out a sprint zone, a stretch of road about three miles long completely devoid of stop signs or major obstacles. The idea of “sprint zones” is that in these areas the group can split up and go at their own pace (read: go like hell, attack, and otherwise mess with each other), then join back up at a “regroup point” afterward. 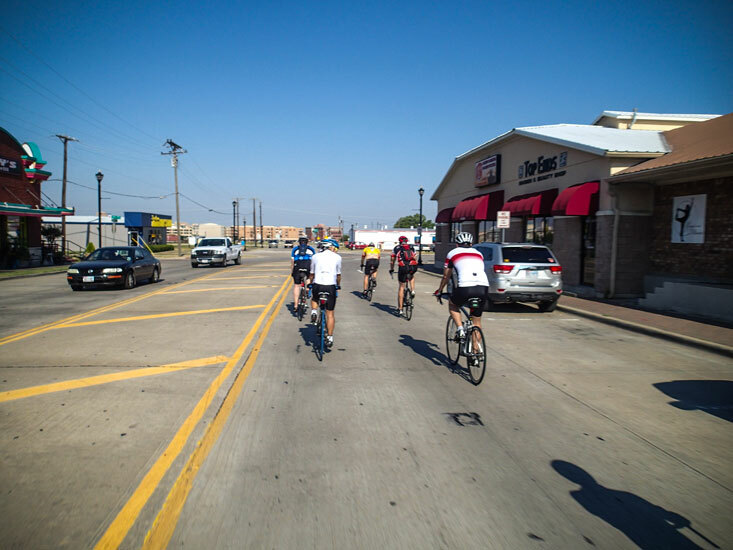 In this case, the zone was superbly planned; the three-mile stretch led to a turnaround at the circle drive of a golf clubhouse, which sends riders back down the same stretch, making for a 6-mile sprint leading into the second rest stop. Those not wishing to sprint could either ride the six miles at their own pace or just head straight over to the Walgreens for an extended rest stop. I’m pretty sure most of our group chose the sprint, though lots of people rode at their own pace. Almost immediately upon entering the sprint zone the riders around me (I was about seven riders back from the front in a side-by-side line) took off. As I slowly rolled back at my normal pace, a second group of riders (including Mitch) came by quickly, but at a slower pace than the leaders. I hopped on the back of their line and drafted my way down to the turnaround and back, working up the line a bit as other riders dropped off. We ended up being the second group into the rest stop, with lots of others not far behind. At both stops I refilled my water and Skratch bottles. I intended to make rice cakes for the ride Friday night, but I forgot. Thankfully Mitch came prepared with 16 of ’em, a variant of my normal cakes that deleted the blueberries and sugar, replacing them with rehydrated raisins and shredded coconut. They worked out to about the same ~180 calories as mine, so I gladly accepted three of them before the ride with the intent of eating one about every hour and a half. Normally I’d take in one an hour, but as this ride was intended to be significantly easier, I figured I could get away with less nutrition. I was right: at the last stop I ate my third and final rice cake, and I wasn’t overly hungry until after the finish. Also at this last stop, I saw a nice woman who was training for her first full Ironman biting into a Honey Stinger Waffle. When I asked her how it tasted, she was kind enough to break off a tiny piece for me. It was the strawberry flavor and was quite tasty. She pointed out that the chocolate version is even better, though they’re apparently hard to find on store shelves. Her advice was to buy the whole box if you happen to run across them. By the way, I think allowing one of your fellow athletes to sample a bit of nutrition — especially the stuff you can’t get without ordering it or buying it by the truckload in large containers — is a really kind and important thing to do. Anyone who’s ever bought protein powder can attest that various flavors, while nutritionally similar, taste extremely different. The same stuff you love in one flavor can taste like refried dog crap in another. Yet manufacturers still fail to offer sample-sized portions. I’d happily pay $15 for a “sampler pack” with a quarter of a serving of the powder in each possible flavor — especially when my only other option is to buy a $30-$60 tub of the stuff. Anyway, before I left, I gave the woman who shared a sample of her waffle one of my serving-size Skratch packets for this very reason. After a short ride from rest stop two — and a fun sprint over the last two miles — we arrived back at the start around noon. As Audra’s shorter ride had finished up at 10:30, she took the truck home and Mitch gave me a ride home. On the way, we compared notes from the ride. We both thought it felt remarkably easy for the distance, which we both attributed primarily to the cool temperatures and cooperative winds. Looking at the data, I think we were right. You won’t see temperatures like this in August in Texas very often. I spent the vast majority of the day in zone one and two, and afterward I felt tired, but not strained, which is a good thing. 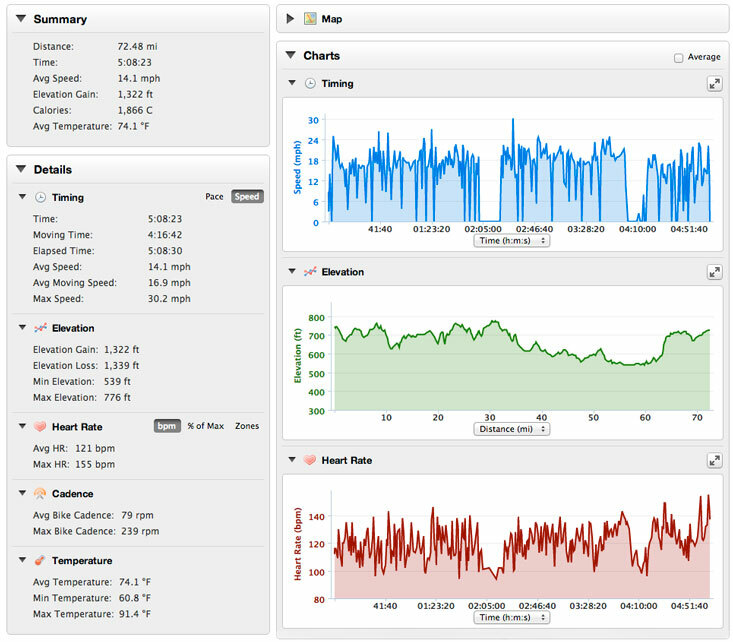 All in all, this was a perfect taper ride. As I’ve written before, I’m not sure what I’ll do once these rides are gone from my calendar. I guess I’ll just have to wait until early next season when they come back. I’m still in the planning stages with my new tri coach, but it already looks like next year is gonna be even more fun than this one — with some new awesomeness on the horizon.